V-shaped case (outside-scale). Straight form or 90° angle form. 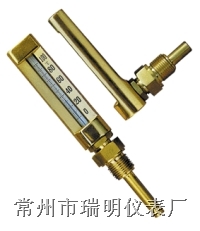 Thermometer fluid:Mercury,blue or red organic liquid. Themperature range:-60 to 600 Celsius or Fahrenheit. Upper part:Aluminum die easting gold anodised.